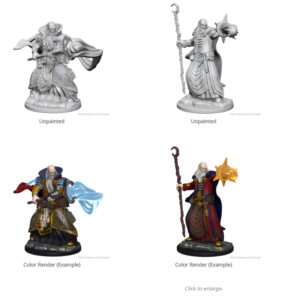 If you want pre-painted plastic miniatures for your Dungeons & Dragons or Pathfinder games, WizKids is the place to go. And if you prefer to paint your own stuff, apparently they’re in on that, too. 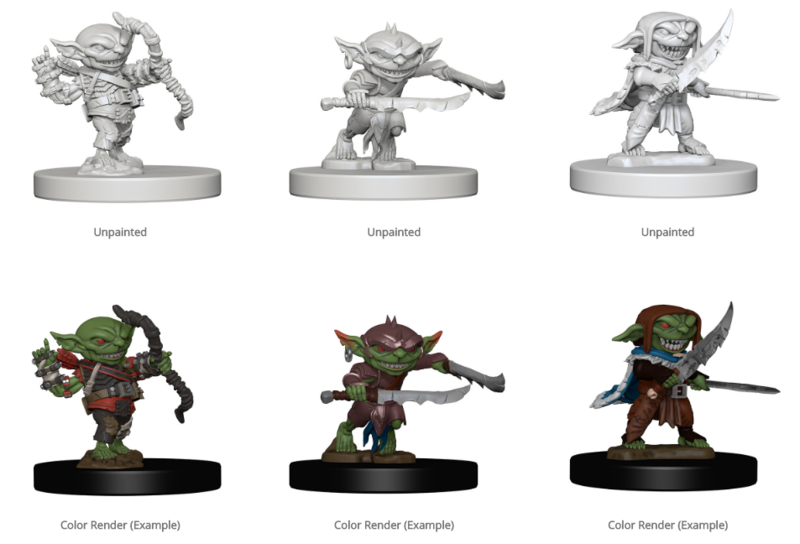 This week, WizKids announced a pair of lines of unpainted miniatures that will feature more than 100 sculpts for the two most popular RPGs: D&D’s Nolzer’s Marvelous Miniatures and Pathfinder’s Deep Cuts. Both will be available in January 2017. What they didn’t announce: What they’ll cost, what material they’ll be made of and what they’ll look like. Though 3D renders were offered, it’s hard to tell what they’ll actually look like in your hand. If they’re highly detailed, count me in. 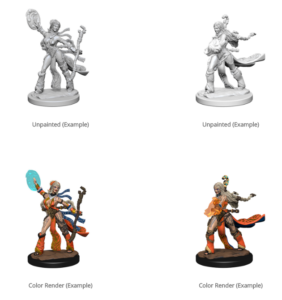 If they end up looking like the Pathfinder Battles or D&D Icons of the Realms pre-painted minis from WizKids, no thank you. I love their pre-painted stuff since they’re generally less expensive and they’re table-ready even though they’re not always the most beautifully detailed pieces. 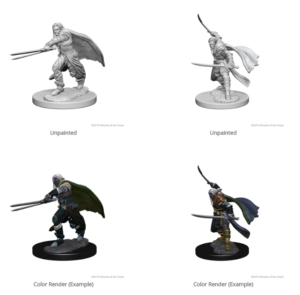 I’d rather buy more detailed unpainted minis from Reaper, which already offers unpainted (and officially licensed) Pathfinder miniatures as well as a host of other fantasy minis in metal and plastic that will fit just about any need. 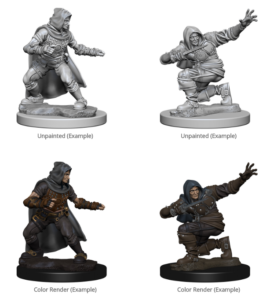 But as my friend John told me today, they’ll probably be similar to WizKids’ iconic boxes from Pathfinder. And those are pretty sweet. 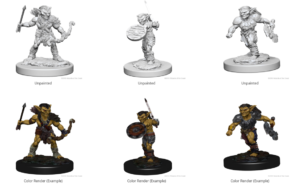 The Pathfinder line will feature 38 unpainted miniatures for the main character classes (fighter, cleric, rogue sorcerer, paladin, monk and barbarian) and monsters (goblins, familiars, hellhounds and a unicorn). 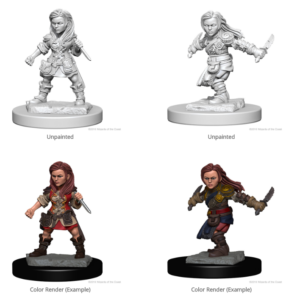 Almost every miniature will be offered in multiple poses. 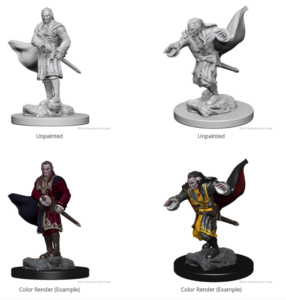 The character miniatures look like Pathfinder’s iconic characters, but they can obviously be painted however you want. See all the Pathfinder renderings here. The D&D line is much larger. It will similarly offer character classes and monsters, but about double the amount of miniatures: 60 miniatures with 10 or so that still haven’t been shown. The monsters include goblins, kobolds, spiders, skeletons, orcs, gargoyles, bugbears, familiars, ghosts, vampires, mindflayers, zombies, blink dogs, gnolls, ghouls, trolls, griffins and displacer beasts. See all the D&D renderings here.